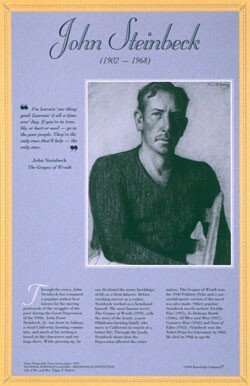 This unique educational poster of writer John Steinbeck features a striking artistic depiction of him, as well as a quote from "The Grapes of Wrath," and concise biographical text summarizing his life and career. John Steinbeck is best known for his moving portrayals of the struggles of the poor during the Great Depression, most famously depicted in "The Grapes of Wrath." This novel won the 1940 Pulitzer Prize. 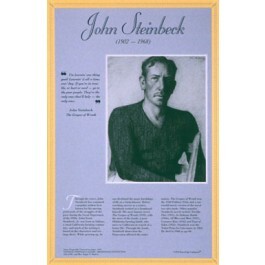 In 1962 Steinbeck won the Nobel Prize for Literature. this poster is a great way to introduce students to this important 20th century American writer.